How skillful are your employees when it comes to delivering customer service? Here are some skills that all employees need to develop if you want to consistently deliver quality care. Empathy is the ability to step into the customer’s experience and accept what they are feeling without judgement. This helps you understand the customer’s point of view, so you can better help them. The highest compliment you can pay someone is to listen to them without distractions. This can be challenging since we often spring ahead to what we think the solution might be rather than staying focused on the speaker. See my blog post Key Listening Skills for more information. Product knowledge. Customers expect you to know everything about the products and services offered by your organization. Stay up to date on innovations, marketing and sales materials, and overall product knowledge. Customers want decisions and resolutions NOW! Understand how much authority you have and be willing to make decisions independently to the extent of that authority. If you need to refer the customer to someone else, make the transaction as smooth and easy as possible. 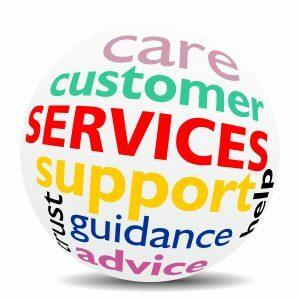 The more you improve the customer service skills of your staff, the more your customers know you care about them. Check out my program Creating a Positive Customer Service Experience. 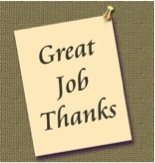 I want to thank all of you who read my blog and take the time to comment. It is important for me to give you practical information you can use on the job to improve your skills and those of your team. I would love to hear from you about topics you would like to see covered in future posts. Thanksgiving is one week away. Now is the time to thank your team. Here are some tips to make this easier and more effective. Host a get-together for the entire team. If your team is small, you could cater in lunch, hold a pizza or dessert party, or even take them out to lunch. If you have a large team, consider a potluck, but provide dessert or the entrée. Give each person extra time off. 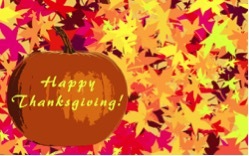 Close the office early to thank your staff and give them time to prepare for the holiday. If you can’t completely shut down operations, stagger time off so everyone benefits. Take time to meet with every team member in person, if possible. Just a quick greeting and thank you will boost morale! If you can’t meet in person, consider sending personalized, handwritten notes to everyone with a message of your appreciation for their efforts in the past year. As a last resort, use a general thank-you email, but know that it doesn’t have the same impact as a personalized message would. Present team members with certificates of appreciation, especially those who have delivered extraordinary results during the year. It doesn’t take a lot of effort to show your team they matter to you as individuals. The stronger your personal relationship with your team, the stronger your leadership ability! For those of you who have taken my GO System program, you know that clutter–unfiled paper, electronic documents, and emails–has a negative impact on your ability to be positively productive. Researchers at Princeton University discovered that visual distractions—like that caused by clutter—will impair your ability to focus and get the results you need. Clearing clutter and staying clutter-free is easy for some people. They know exactly where everything is located and filed away. On the other hand, some of us are “out-of-sight-out-of-mind” people. If we don’t see it, we don’t remember where we put it! 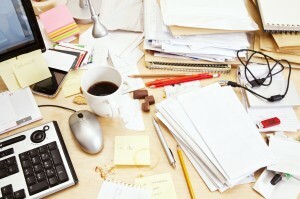 So, how do you clear the clutter when it’s necessary to help you stay on top of things? Set up a clear labeling system. I recommend using the same labelling system for paper, electronic documents, and email. This makes it easier to move from one medium to another. Use big labelling terms, like Insurance, Budget, HR, Vendors, and so on. Within these large categories, you can establish sub-categories. This will make it easier to file and retrieve documents. Save documents based on relevance. Relevance means that the document has meaning for you. The ones you use most frequently should be easiest to get your hands on. Documents you refer to less often can be filed away. Use archive files. Archive files let you file documents more than one year old and remove them from your workspace and your desktop. Set up a follow-up system. If you are afraid that you will forget to follow up with something, you can create a reminder on your calendar or set up a system that lets you keep track of documents you can’t finalize. Stay on top of filing. I recommend that you take time each day to file completed documents and clear existing clutter. If you have a lot of paper clutter, you might want to tackle it by the inch! It only takes a few minutes every day to get and stay organized and be more positively productive. As we wind up the year, take time now to set yourself up for success in 2018. Need help with email? See my Writing and Managing Email program for more information.